Nice tutorial. I’ve been messing around with an 8 bit shift register to control my quad half H bridge chip which in turn controls the motors of my little pet robot. To drive just 2 motors I didnt gain any pins, but it does allow me to upgrade to 4 wheel drive later down the road if I would like. THANK YOU!!!! Thank you, HAD, for the clean breadboarding plug! Something everyone should do but very few do. Thank you. 343 stepper motors and a pile of shift registers. motors off 9 bits of data from the PC. generally much nicer than a simple shift register, especially if they buffer clock and data for cascading. as an idea for a more advanced project, here’s a lovely led random number generator based on 4 shift registers. Looks like the site is down. /.’ed?!?!? eh, if I were to clip the leads of components, then i would be really limited with where i could reuse them. 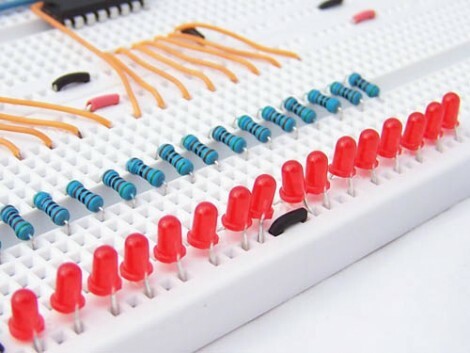 I think i will stick with my messy breadboards and save the resistors and LEDs for future projects. Seems odd that they are using a shift register chip but don’t acutally use any standard ansi c bit shifting operators in the code. Doing so would improve the extensibility, save a few lines, save a bunch of cycles and would make for much more portable code. That said, this is pretty good explanation of the hardware involved.